Jackie Jensen was one of America's sporting greats. An outstanding collegiate football player and baseball player for the University of California at Berkely, he is one of the few athletes to have ever played in both the Rose Bowl and baseball's World Series. His career as a professional baseball player took him to the title of American League Most Valuable Player in 1958, with a career which included playing for the Washington Senators, the New York Yankees and the Boston Red Sox. He is honored as a member of the Bay Area Sports Hall of Fame and the Boston Red Sox Hall of Fame. 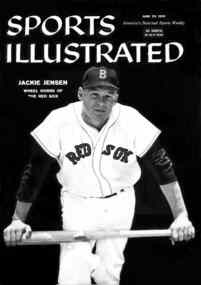 Football and baseball great Jackie Jensen was born in San Francisco 1927. An All-American halfback at the University of California, Berkeley, he also played on the UC baseball team as a pitcher-outfielder. Jensen began his professional career playing for the Oakland Oaks of the Pacific Coast League, and in 1949 was sold to the New York Yankees. He was traded to the Washington Senators in 1952, and a year later went to the Boston Red Sox where he played through 1961. In 1958, Jensen was named the American League MVP and led the league in runs-batted-in. He has the unique distinction of playing in both the Rose Bowl and the World Series. Enshrined in the Bay Area Sports Hall of Fame in 1983." Off the field, Jackie was one of the icons of his era: handsome, generous, and gentlemanly. He featured on the cover of many magazines, including Sports Illustrated, shown here, and was the subject of a feature film, "The Jackie Jensen Story". He was painted by Norman Rockwell. He also featured on numerous baseball cards by Topps and others, often spending hours signing autographs for fans who sent him the cards, and returning them by post. His fear of flying was legendary, causing him to quit baseball at the height of his career. After retiring from baseball as player, he went on to become a sports presenter for ABC TV. He was also the baseball coach for the University of Nevada, Reno, and at his alma mater, Cal Berkeley, before moving to Virginia, where he became a Christmas tree farmer and established the Jackie Jensen Baseball Camp at Fork Union Military Academy. Throughout his life, Jack remained an outstanding sportsman - skier, tennis player, and golfer. He played in the Bing Crosby Pro Am tournament at Pebble Beach for many years, and won the Michelob Busch golf tournament in Williamsburg, Virginia shortly before his death in 1982. Image courtesy of and Copyright Sports Illustrated; other content Copyright © quoted authors.